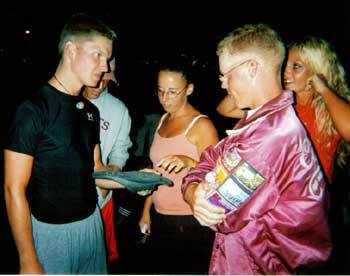 Ellen Gibson, a 2004 member of the Cadets guard, sent in this one. "Here is a pic taken on semifinals night when my friend Jeff, a trumpet player with the Cavaliers, tried to explain to me and my friends, all Cadets, about their marching technique. From left to right are Jeff, Debbie, Mikey and I in the corner. Needless to say as a guard member I wasn't very interested as you can probably tell from the picture. But we were all great friends and still talk when we can. That sometimes proves a bit difficult as I am from England but I try my best to keep in touch and I can't wait to see them all in Boston this summer for finals." Thanks Ellen!